Our photos are wonderful!! We are so happy with how professional and beautiful they are. It was a pleasure to share our wedding day with Giuliano and we are looking forward to getting our album. Thank you!! From the very first email I sent him, Giuliano was efficient, friendly, polite and a pleasure to deal with. He always got back to me promptly and answered any questions we had. On our wedding day, he was a lovely presence to have around, very unobtrusive and so many of our guests remarked on his cheery smile. He and Monika captured all of our important moments and were both really patient when things ran a little over schedule. We received our video in good time and we're really happy with the end product. Thanks, Giuliano! Pleasure to work with. Best choice if you looking for professional who has passion for his job and is very helpfull and kind. Very recommended. Giuliano Bausano did the best job with our wedding photos. I couldn't believe the amount of beautiful shots he managed to capture, without us even knowing he was capturing them! He is absolutely fantastic at what he does and anyone getting married in Rome/Italy should book him ASAP! :) I am so glad to have met Guiliano and am so grateful to him and all his wonderful team! What an incredible service. Giuliano was super professional, creative, and a true expert on how to catch the moment. We could't be happier with his videography services at our wedding. We wish we would have also asked him to take the photos! We couldn't be happier! 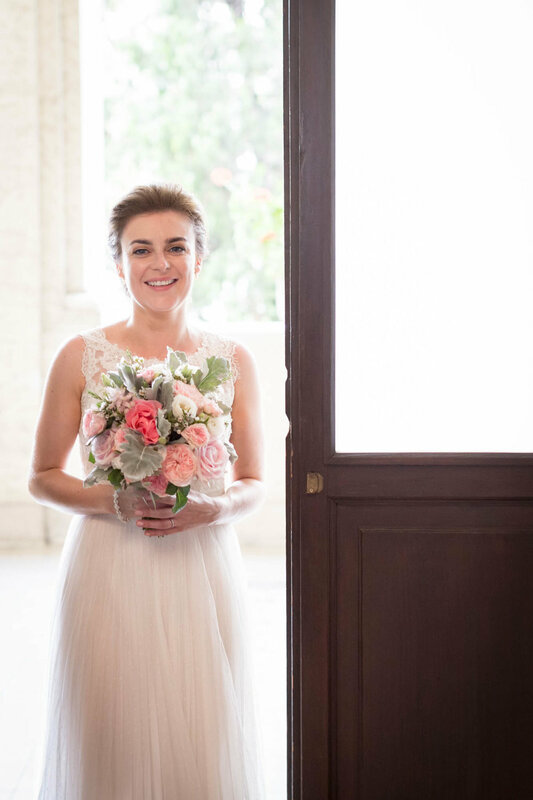 We were extremely happy with the service provided by Giuliano, and we absolutely love our final photos. A flawless and very high standard service. Highly recommend. I recently had my magical wedding captured by Giuliano. He was very quick to respond to all my emails. 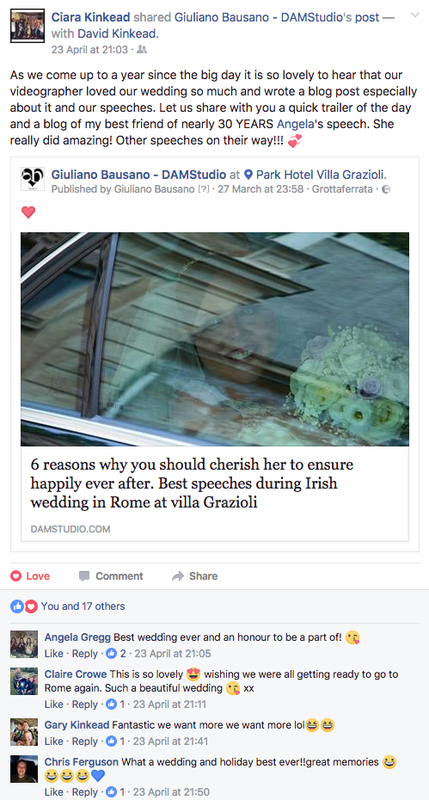 I was planning my wedding in Rome, Italy from Ireland and having Giuliano was just a pleasure. Giuliano was very professional and he is extremely talented in what he does. I found Giuliano very easy to work with and he catered to all my suggestions. It was a pleasure to have him part of our wedding and I highly recommend Giuliano for any magical event that a couple wants to remember for a life time. Guliano is not only prefessional, but also very kind person. By preparation of our wedding he was interested in culture, people, habits in our country. I was very suprised. Quality of cameraman in Slovakia is not so good. Our wedding was not only one day - it was ceremony, celebration and genesis of our love. Thanks to Gulianno we have memory till the end of our life. Magical and stunning output! We were so pleased with our video. It truly captured the beautiful essence of the day! Giuliano was truly a professional! I haven't met him before the wedding since he was from another city and my wedding planner organised it, and I still immediately warmed up to him. His immaculate appearance put me at ease straight away. He had this amazing ability for coming up close without feeling of intrusion. The best feedback I can give of Giuliano is from my photographer. My professional photographer friend was initially wary of the fact that I booked a videographer, because he mentioned they can be clashing, as videographers can stand in the way and somehow be in every photo, especially far landscape shots. After the wedding, my professional photographer friend had only the highest praise for Giuliano, and seeing the video it was so personal I couldn't believe Giuliano captured it all. Giuliano, grazie mille!! Very professional and extremely creative videographer and creative team. Giuliano and his team knows the best way to capture every moment of any special occasion. We couldn't have found a better and more warm team to cover the most special day of our lives - our wedding. As a Bride, I felt completely stress-free with my dealings before and on the wedding day. The team flew down from Italy to Florida, USA and everything was flawless from start till the end product. Our wedding video speaks it all: https://www.youtube.com/watch?v=PfAkUyth-Dc We highly highly recommend DAM Studio to every bride and for every special occasion internationally. Un servizio impeccabile, dimostrazione di professionalità, cortesia e preparazione ad altissimo livello, soprattutto nella cortese interazione con gli invitati, solitamente poco disponibili a farsi fotografare o filmare. Invece, il garbo e la simpatia dello staff di D.A.M.Studio, è riuscito a mettere a proprio agio anche la nonnina di 80 anni e a rendere piacevole e divertente lo scatto più simpatico e longevo :) Preparazione professionale, cortesia e discrezione nello svolgere il servizio sono qualità necessarie per rendere il matrimonio, tappa importante nella vita di ognuno, un evento indimenticabile, festoso, gradevole ed armonioso. Un ringraziamento sentito a D.A.M.Studio per precisione, puntualità e disponibilità. I had booked Giuliano not knowing him or his work, one of the best decisions of my wedding, a true gentleman so laid back and easy going, put me and my family totally at ease. Am so delighted with my choice! D.A.M. Studio provided a video service for my wedding day. Since it is a very important day obviously we were all worried about everything. The presence of two video operators was invisible to us at home, in church and during reception party and everyone felt at ease. The way of filming was agreed to be without default poses so the film looks real natural and romantic as we wanted. This is an outstanding and talented videographer and would highly recommend him for any special occasion. I absolutely recommend you D.A.M. Studio and in particular the wonderful Giuliano, that with his talent and passion has realized an extraordinary wedding movie (for my wedding!). Every person that see the video can just love it and would like to marry for a second time to have the opportunity to see that day with Giuliano's eyes. More than a professional video maker, but a friend that can listen and satisfy you in every possible way!! great job! !a beautiful video...every time we watch it...we cry with emotion...the best memory of our wedding... thank you, giuliano!!! Giuliano è una Grande Persona e un Super Professionista!Riesce a rendere magica ogni ripresa e catturare tutti i momenti indimenticabili di uno dei giorni più importanti della tua vita!!! E inoltre, e questo non guasta, è simpaticissimo e capace di metterti a tuo agio! Grazie mille Giuliano!